Angela Ruggiero played here at Bright-Landry Hockey Rink for four years, graduating in 2004. In late February, Angela Ruggiero ‘04—a former Harvard ice hockey player—stepped down from her position on the International Olympic Committee Athlete’s Commission. The IOC is a group that represents all Olympic athletes across the world. She served on the IOC for eight years and before that played in four Olympic Games, winning a gold medal in 1998, two silvers in 2002 and 2010, and a bronze in 2006. She is also the all-time leader in games played for men or womens’ United States Ice Hockey. Ruggiero is considered one of the greatest female hockey players of all time and also one of the best Harvard Hockey players in history. Angela Ruggiero ranks sixth in all-time career points at Harvard with 96 goals and 157 assists, for a total of 253 points. Ruggiero also won the Patty Kazmaier Award in 2004, which is given to the top player in U.S. women’s collegiate hockey. 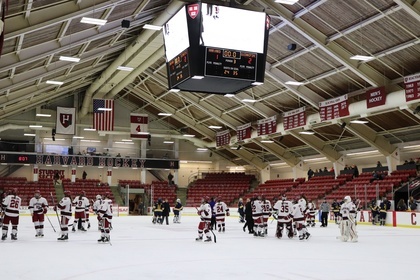 During her time at Harvard, the Crimson had a 109-13-5 record. In 2015, she was inducted in the Hockey Hall of fame, only the fourth women ever to receive that honor. Ruggiero was elected to the International Olympic Committee Athletes’ Commission in 2010. A few of the projects she has helped with while on the IOC include keeping the Winter Youth Olympic Games Lillehammer 2016 on track, advocating for women in the sports world, and also bringing the Olympics to Los Angeles- her hometown- in 2028. Another part of her role on the IOC includes giving out Olympic gold medals. Ruggiero placed the medals around the necks of the US Women’s soccer team in 2012, the US women’s basketball team in 2016, and on the US women’s hockey team about a month ago. Even though Ruggiero will no longer be on the International Olympic Committee she still plans to stay involved in the workings of the Olympics. Ruggiero is still on the ethics commission, the digital technology commission, the Beijing 2022 commission, and on the Olympic Channel board of directors.